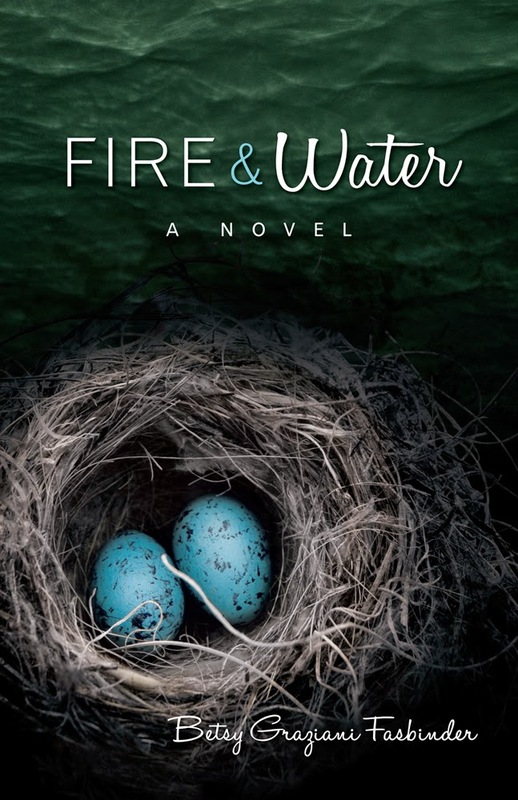 Today we are interviewing Betsy Graziani Fasbinder, author of Fire & Water. I'm a lifelong lover of books . I just love learning about how someone else sees or experiences the world through a story, whether it's ﬁction or memoir. I live in the SF Bay Area with my husband in our recently empty nest. Our dog, Edgar, has now inherited our parental energies. Describe the plot of Fire & Water in a few sentences. F&W is a story that redeﬁnes what "family" really means. At it's core, it's a love story, but not a ﬂuﬀy romance by any means. Kate Murphy is a pediatric surgeon, book smart, but naive in the ways of the world. She's raised by her widowed father and a band of close "family" pub regulars in his SF Irish pub. When she meets Jake Bloom she's unprepared for what passion is, and blind to the mental illness lurking behind his artistic genius. She's in too deep before she understands the gravity of his condition. It's by learning to rely on those she loves that she navigates through the life and death decisions she has to make for herself and her daughter. Who do you think would most appreciate reading this book? I've been stunned by how many people say that they have someone in their family or close circle who are touched by mental illness. This is a love story, but not a "romance" in the classic sense. So I'm ﬁnding that people who appreciate a nuanced story, with real-life dilemmas appreciate it most. Also, the book appeals to those who appreciate art because of its themes of creative genius. What inspired you to write a book a character who suffers from the deception of those around her? What's unique about Kate being "deceived" by her family is that their motivations for hiding harsh truths about her mother come not from a place of deceitfulness, but of misplaced motives of protecting her. When it comes to Jake, she's not so much deceived, but naive, and in denial about the depth of his mental illness. She's a physician who thinks she can "ﬁx" everything medically, but she's stunned when all that she knows is of virtually no help to the one she loves most. Tell us a bit about the main character, Dr. Katherine Murphy. Kate is like so many people, particularly women, I've known. She's powerful in lots of ways. She's smart. She's a take-charge person in her professional life. But when it comes to her personal life, she's not as powerful. She's book smart, but lacks life experience that might equip her to handle what comes up. It's through her close friendship with her shoot-from-the-lip friend, Mary K that she eventually understands the reality of things. I love all the characters, of course. But Mary K was the most fun to write. She's profane. She's bold. She's smart too, but like Kate she's less skilled and functional in areas of her own life. In a way, Kate and Mary K are exactly opposite. In other ways they're very alike. I have three big projects in the works: A collection of memoir stories called Filling Her Shoes (about marrying a widower and adopting his son as my own). A non-ﬁction book called Public Speaking for Writers and Other Introverts. And, I'm about 1/3 through writing a new novel set in Wine Country, California. This book has some very dark themes, but it's also about the power of love and the meaning of family and friendship. While it has emotionally wrenching parts, readers have also called it inspiring and uplifting.